Although there has been a University of Chester only since 2005, its predecessor, Chester College, dates back further than most UK universities, to 1839. This book celebrates the 175th anniversary of the foundation in 2014. The story is a remarkable one of survival and success. The early College was a pioneering venture with a unique approach to learning and the University still houses the first buildings in England specifically designed for the training of teachers. Three times, in the 1860s, the 1930s and the 1970s, Chester College came near to closure, only repeatedly to emerge intact and to become stronger than before. In the early twenty-first century, the University has a growing reputation within the higher education sector and can claim some of the highest rates of student satisfaction in the country. The book’s title is taken from the College motto of the late-Victorian and Edwardian period: as appropriate today as when it was coined. Paired Book Review of On Chester On: A History of Chester College and the University of Chester with Oriel College: A History by Michael Shattock, UCL Institute of Education, in History of Education: Journal of the History of Education Society, 2016, DOI: 10.1080/0046760X.2016.1189602. Chester's history offers a self-published, but well-written and scholarly, narrative of the transformation of a college of education through the various stages of two-year and three-year diplomas to BEds and BAs and BA Honours under the aegis of Liverpool, and then to full university status ... It is a story of institutional evolution running in a parallel with the national and international transformation from elite to mass higher education and is rooted in a local and regional context. Review of On Chester On: A History of Chester College and the University of Chester (by Graeme J. White) by Rod Hunt MBE (children's author and alumnus of Chester College, now the University of Chester). The hallmark of Graeme White's book is its honesty and clarity. His meticulous research of the historical records results in a story both compelling and enticing. Dr White also reads between the lines of his sources, giving us a delicious and fascinating insight into the minds and motives of the key players in the institution's history. Further gems of information are to be mined in the chapter end notes. Review of On Chester On: A History of Chester College and the University of Chester (by Graeme J. White) by Marion McClintock, University of Lancaster, for the British Association for Local History. The history of British tertiary and higher education is important and incomplete. Volumes such as On Chester On are valuable for all those associated with individual institutions, while contributing through the story of one particular trajectory to a fuller understanding of how and why higher education in the UK has reached its present position and how it might evolve in the future. 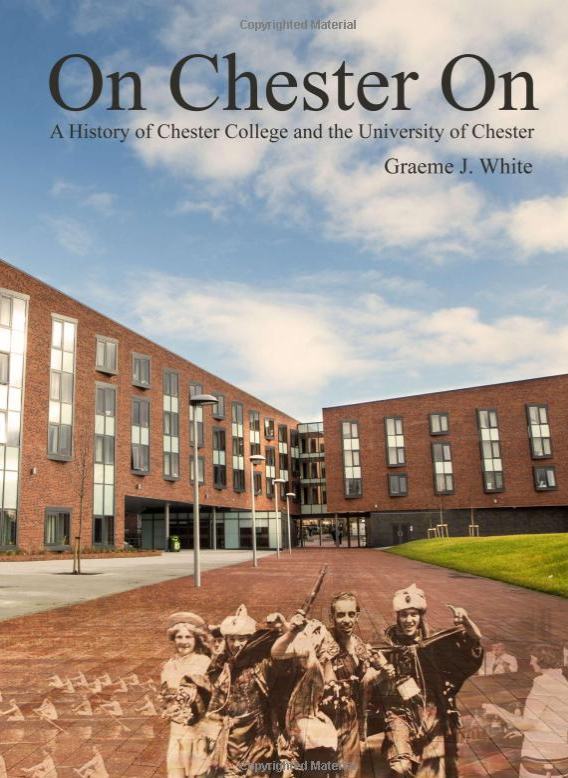 Review of On Chester On: A History of Chester College and the University of Chester (by Graeme J. White) by Peter Carrington, for the Journal of the Chester Archaeological Society, new series, 85, 2015, pp. 15-18. '... we are offered a very detailed and well informed, sympathetic but by no means uncritical work of institutional history. This work can be read from a number of viewpoints - local, national, ecclesiastical, secular, educational, administrative and social - and it deserves to be taken into account by all the appropriate scholars.